“The Game I have been watching and waiting for! “LAST NIGHT’S GAME WAS A POWERFUL PROPHETIC SIGN OF THE SPIRITUAL WARFARE THAT IS TAKING PLACE IN THE HEAVENLIES CONCERNING BRITAIN LEAVING THE EU, AND IT WAS ALSO A POWERFUL PROPHETIC SIGN OF THE ‘GREAT VICTORY’ THAT GOD HAS PROMISED TO GIVE TO THE PEOPLE OF GREAT BRITAIN IN THIS HOUR. “I PROPHESY GOD HAS OVERTURNED THE CURSE THAT HAS BEEN OVER THE LAND. “WE ARE BREAKING FREE FROM THE EU…! Read that earlier word and listen to her account of receiving the Lord’s new words above wherein she explains her lack of knowledge of football history and the ‘penalty curse’. Also, at 3:30 mins she offers for weighing a vision of Jacob Rees-Mogg MP, thus confirming my long-held suspicion of his destiny of high political office. Hence, the outcome of my Scriptural Meditation on Parliamentary Plotting wasn’t such a great surprise!! This entry was posted in Destiny, Europe-EU, Prophetic, Sport, UK and tagged New Season, Prophecy-today, V_West by Richard Barker. Bookmark the permalink. I’ve been thinking – well, it’s all speculation for most of us at this stage isn’t it – what would be a very significant-looking outcome would be a final between England and Belgium, as of course Belgium is where Brussels is (not to mention the ineffable Guy Verhofstadt). If England were to beat Belgium to win the Cup, having earlier lost to them at the group stage, that would make for a very unsubtle kind of parable to the world. Anyway, I don’t know, but it’s nice to dream! 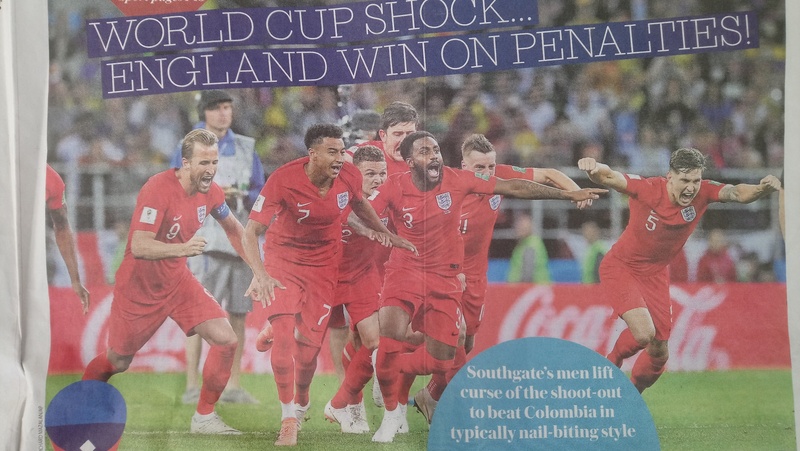 I saw a news story just after England beat Colombia in the World Cup. In the story, the coach for Colombia accused the American referee of helping England win their match with Colombia. To me it is prophetic: it’s the Anglo-American Spiritual Alliance that is going to help destroy the global elites represented by the World Cup. Have inserted link to that in further details given in next post (‘half-time’). Maradona was the one who claimed “Hand of God” scored a dubious goal of his for Argentina. You might have caught refc to that in photo for a recent post.